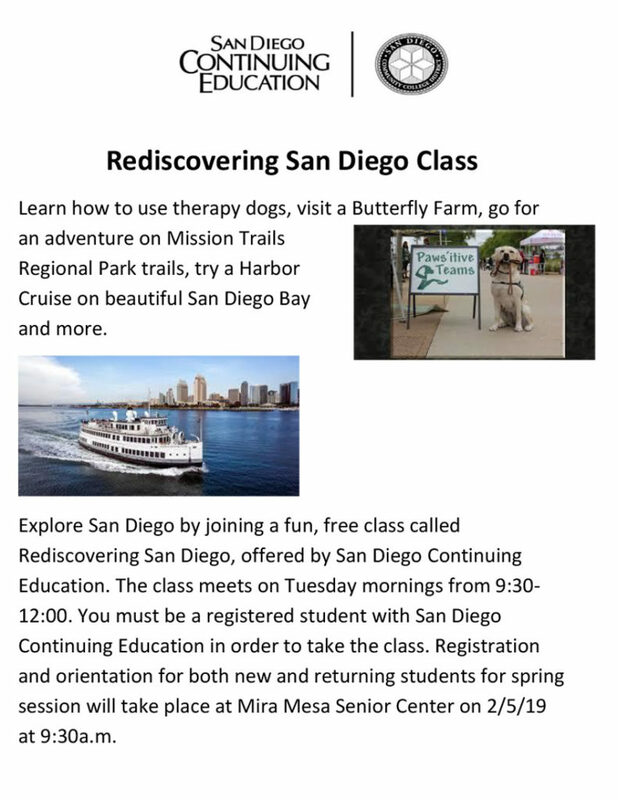 Learn how to use therapy dogs, visit a Butterfly Farm, go for an adventure on Mission Trails Regional Park trails, try a Harbor Cruise on beautiful San Diego Bay and more. Explore San Diego by joining a fun, free class called Rediscovering San Diego, offered by San Diego Continuing Education. The class meets on Tuesday mornings from 9:30-12:00. You must be a registered student with San Diego Continuing Education in order to take the class. Registration and orientation for both new and returning students for spring session will take place at Mira Mesa Senior Center on 2/5/19 at 9:30a.m.